Electric mattress pads are a game changer! I can’t imagine getting through chilly winters without one! I used Walmart’s pickup service for the first time this week! What a time saver that is!!! My kids are grown, but I can’t imagine what a game changer this must be for you young moms! And hooray for the Great British Baking Show! It’s about time for me to go back and watch them again! Thanks for the fun post! I’m stopping by from the MMD linkup. I’ve had an electric mattress pad for 20+ years. I couldn’t live without it! If I send all my shells to your mom would she make me a wreath????? I love it! I keep hearing about the British Baking Show, so I really need to check it out! I bet our daughter would love it too! 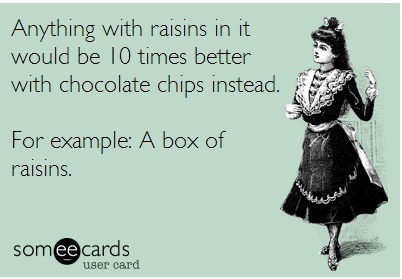 Hahaha I laughed out loud at that chocolate chip someecard. So so true! Great British Baking Show is an all time favorite. I wish I could find more seasons of it, though. I just finished season 3 and I’m going to be “gutted” when I’m through season 4!